In 2017, El Paso Water celebrated the 10-year anniversary of its International Water Quality Laboratory by thanking the employees who make public health and safety a priority every day. The 27,000-square-foot facility consolidated four laboratories that were located at the utility's plants throughout the city. The new lab provided a better, safer work environment and established a national model for water quality laboratories. To meet the demanding requirements of state and federal regulatory agencies, the new lab incorporated many cutting-edge features including an ultra-clean air system, a reverse osmosis water purification system, a dedicated data management system and a modern, open design. "We often talk about our leadership in water supply innovations, but just as essential – if not more so – is the work we do to guarantee the health and safety of our water supply," President and CEO John Balliew said. "When people tour this facility and see first-hand this modern laboratory, it builds tremendous confidence in what we do." Consistent with state and federal regulatory requirements, EPWater tests hundreds of tap water samples a month to carefully monitor the quality of the drinking water. The high-tech facility depends on employees' knowledge and expertise to ensure that monitoring and sampling is done correctly. EPWater leaders thanked lab employees for their commitment, service and diligence. The lab reviews more than 45,000 samples and performs more than 250,000 chemical and biological analyses each year. 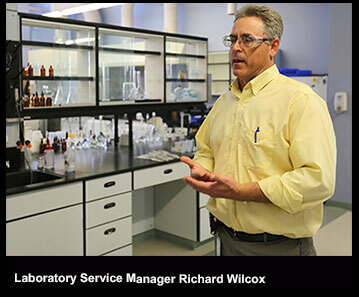 Laboratory Service Manager Richard Wilcox said he and his employees take their role in providing safe drinking water to the community very seriously, and he credits employees for the lab's success. "We know we have an impact on everybody," Wilcox said. "It's a good feeling to know we serve the community in such an important way."